Any discussion of metal boats inevitably encounters the question of whether a boat should be aluminum or steel. Not often realized is that there are other metals that may be effectively used. "Metal Boats for Blue Water" is intended to provide an overview of the possibilities, and to discuss why one might choose metal for a boat's structure. Michael Kasten. 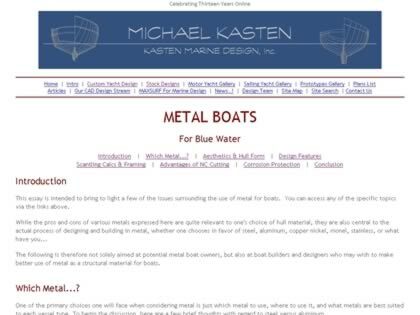 Web Site Snapshot: If available, above is a snapshot of the Metal Boats for Blue Water web site at http://www.kastenmarine.com/metalboats.htm as it appeared when this site was added to the directory or last verified. Please Note that Boat Design Net has no involvement with the above web site; all content and images depicted in the above thumbnail are the property and copyright of Metal Boats for Blue Water unless otherwise noted on that site. Description: Any discussion of metal boats inevitably encounters the question of whether a boat should be aluminum or steel. Not often realized is that there are other metals that may be effectively used. "Metal Boats for Blue Water" is intended to provide an overview of the possibilities, and to discuss why one might choose metal for a boat's structure. Michael Kasten.